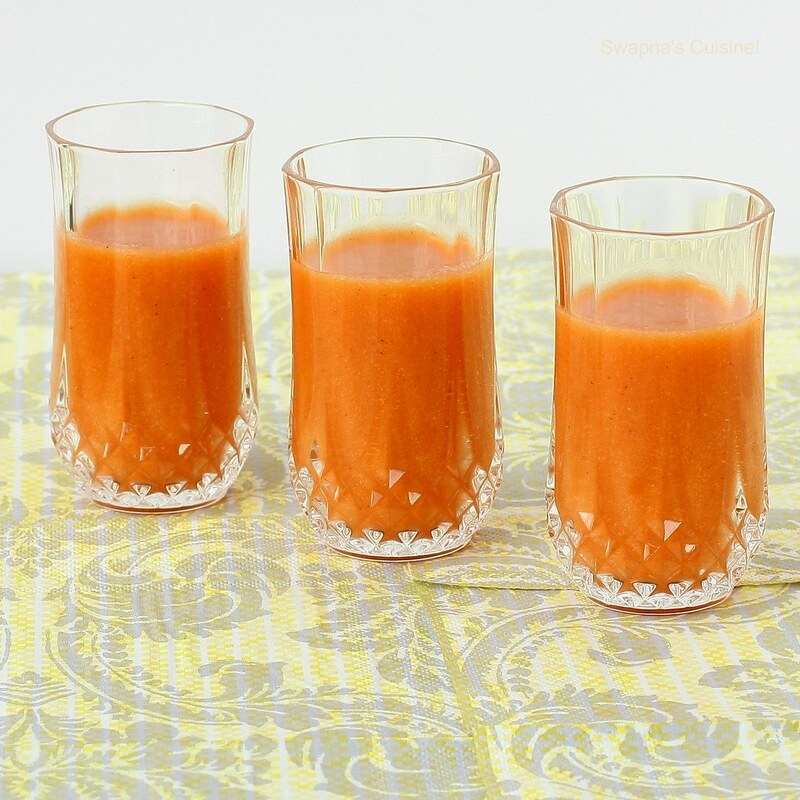 A healthy and refreshing smoothie for any time of the day! 1- Blend together orange segments and lemon with 1 cup water and strain the juice. 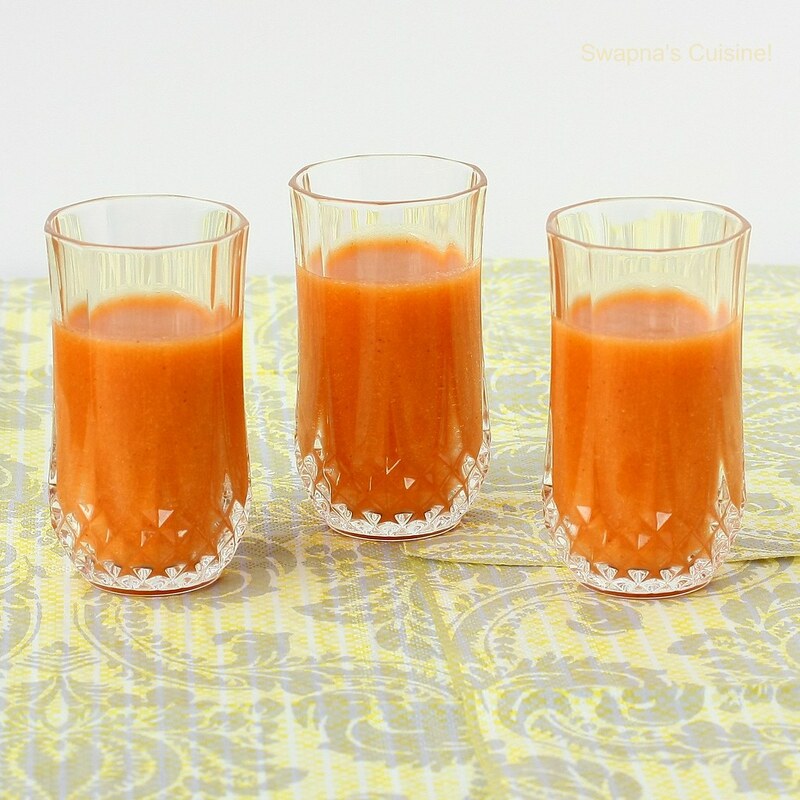 2- In to this strained juice add peeled and cut apple, mango, banana, strawberry, sugar and water and blend to a smooth puree. Pour in to glasses and serve. Note: You can increase or decrease water and sugar according to personal taste. You can even substitute any kind of fruits of your choice. Take gram flour, turmeric powder, chilli and ginger paste, hing and salt to taste in a microwave safe bowl and mix well. Add butter milk to the mixture and mix well with a egg beater or spatula taking care that no lumps is formed. The batter should be thin and flowing without any lumps. Place the bowl in a microwave and cook at high speed for 5 mins. Remove the bowl and mix the contents well. Mean while, keep ready 2-3 steel plates or glass chopping board as I have used and a spatula to spread the batter. Don’t grease them with oil. Place again in a microwave and cook uncovered for another 5 mins. Mix well and check if you can spread them thinly on the back of steel plates or glass chopping board. If the mixture is still runny, place it again in microwave and cook for another 2-4 mins.Spread the thick batter quickly on the back of steel plates or glass chopping bowl. Spread it as thinly as possible. Let it cool for 2-3 minutes. Then slice them with knife into 2 inch long stripes and roll each stripe neatly. Place each rolls in a serving dish. For tempering, heat oil in a skillet and add mustard seeds to it. When mustard starts to pop and splutter, add chopped green chillies and sauté it for few seconds.Spread them evenly over rolled Khandvi. Serve them immediately garnished with coconut grates and chopped coriander leaves and enjoy!!! Idiyappam is a famous typical Kerala breakfast. It is also known to as Noolappam in some parts of Kerala. The best thing about this is it will go very well with any kind of veg or non-veg Kerala dish or even with sugar!!!! Boil 1 cup of water and keep aside for 5 minutes. Meanwhile mix rice flour, ghee and salt well. Add boiled water little at a time mixing well with a spoon, till the dough is soft to touch. Take this dough and put in to an Idiappam press. Press a layer onto idly moulds in circular motion add 1 tbsp of grated coconut in between and press the dough on top of coconut. Continue till whole dough finishes. Steam in a pressure cooker or in an appachembu till Idiappam is well cooked. Serve with egg roast/ stew/ kadala curry or sugar. Mix curd, water, sugar and ginger in a blender. Blend for few seconds. Pour in individual glasses over ice, garnish with mint sprig and serve. This is one of the simple and very tasty snacks my mom used to make. I still love this one any time of the day!!!! Cut bananas in 1/2" circles. In a pan put banana pieces, sugar and ghee and cook in medium flame stirring in between till bananas turn golden brown. Serve warm!!! You can adjust sugar according to personal taste. You can even reduce the amount of ghee if you make it in a non-stick pan….but tastier with lot of ghee!!! Grind coarsely, coconut, onion, green chilies, garlic, cumin seeds and turmeric powder and salt. Heat oil in a frying pan and fry mustard seeds. Add coarsely ground coconut mixture and curry leaves and fry for one minute. In to this add shredded cabbage and grated carrot. Mix well, cover and cook on low flame for 3 minutes. Open lid and stir well until all the water in it evaporates. Serve hot as a side dish with boiled rice.